I am headed to a dear friend's wedding this weekend, and can't wait for some girl time, dancing, and catching up with college friends (it just happens that the wedding is in my old college town, on our alumni weekend). Besides the wedding I am also looking forward to seeing my family, and my 3 week (!!) old nieces too! Hope you have a wonderful weekend, recharge your batteries and do something new! 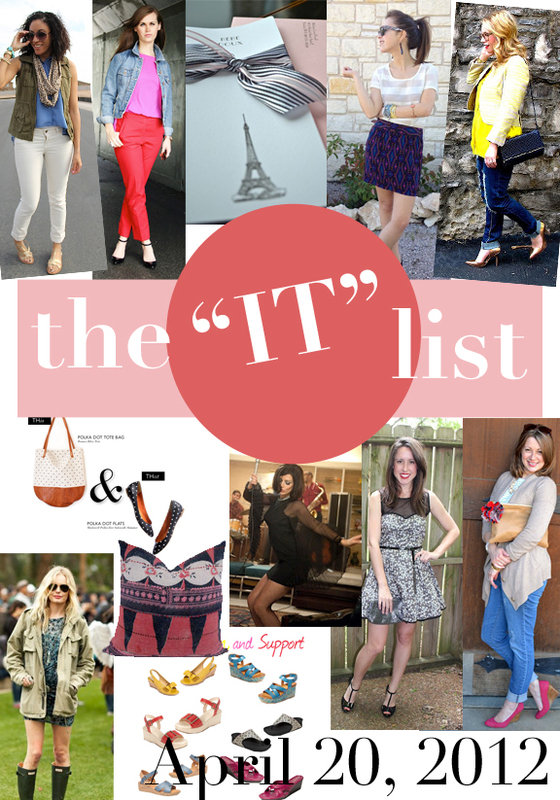 thanks for the "it" list! and loved your look over on WIW. Great list! Love your look! I just came across your blog, you are too cute with your outfits. Plus, I just noticed that you're in Nashville so now I am a new follower :) I'm in Clarksville, an hour away but always driving to Nashville to get my shopping fix. Cute floral dress! I love the t-strap shoes... They have a retro feel to me. Hi! Thanks for commenting on my blog, I've checked yours out and I especially love the Oscar Wilde quote so I'm your newest follower! I think I see some green boots! HA Hope you have a great weekend! Gotta have green boots! I need to pull mine out in this ducky April weather! Hi! I just found your blog and I love it! I'm a new follower! If you want to check out my blog and follow me back that would be lovely!